The hairy-eared dwarf lemur is one of the smallest primates, with a weight of only 80 - 100 g (3 -3.6 oz) and a length of 30 cm (1'). It has been found only in lowland rainforest. Its diet is not known, but this nocturnal lemur may eat nectar or plant gums. Local inhabitants report that it hibernates from May to September. It sleeps in holes in large trees. The hairy-eared dwarf lemur is reported to be found in pairs, with as many as 6 sometimes being observed together. Since 1875, it has only been recorded by biologists in 1966 and 1989 and is only known for certain from eastern Madagascar near Mananara. It is eaten by local people and its habitat is being deforested. *** The hairy-eared dwarf lemur is one of the world's rarest mammals. Up until 1966, the hairy-eared dwarf lemur was assumed to be extinct, since no specimen had been seen since 1875. In 1966 it was rediscovered on the east coast of Madagascar near Mananara. Two live animals were found in the same vicinity, south of the Mananara River, in 1989. As of 1997 it was still known only from eastern Madagascar near Mananara. Its status has changed from Critically Endangered to Endangered since 1996 because of the discovery of new subpopulations, giving the impression that it is more common than originally believed (IUCN 2004) . 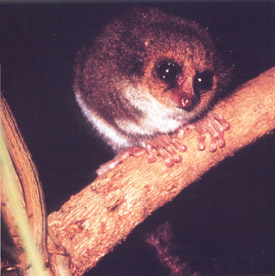 The hairy-eared dwarf lemur is caught in traps in the forest and eaten by inhabitants of the area where it is found. This plus deforestation of its habitat for agriculture and logging are the major reasons for its decline. The hairy-eared dwarf lemur weighs 80 - 100 g (3 -3.6 oz). The hairy-eared dwarf lemur has been found only in lowland primary rain forest. The hairy-eared dwarf lemur lives in the Madagascar & Indian Ocean Islands Biodiversity Hotspot (Cons. Intl. 2005) . It is not known what food the hairy-eared dwarf lemur eats. However, because of its sharp claws and tooth structure, there is speculation that it may be specialized for feeding on plant gums. It also may be adapted to eating nectar with its long tongue. The hairy-eared dwarf lemur is nocturnal. It is reported to become torpid or hibernate in trees or underground from May to September. This lemur sleeps in holes in large trees. The hairy-eared dwarf lemur is reported to be found in pairs, with as many as 6 sometimes being observed together.